The Nightwalker is an Emblem Heartless that is found in Kingdom Hearts II. As Li Shang and his men limp back to the Imperial City, several of them succumb to their fatigue and become Nightwalkers, which immediately attack Li Shang. The Nightwalker has a spherical head with a jagged mouth and glowing, yellow eyes with black rings around them. Its skin is sky blue, and its arms are always held stiffly out in front of its body. It dresses in high-collared, purple robes with hand blue and yellow lining on the loose, furisode-esque sleeves. The front of these robes is magenta with yellow lining. It also wears a wide, flat-topped hat that is purple on top and magenta near the base, with the two colors being separated by a yellow, zig-zagging line. It also seems to wear pointed shoes, though because they are the same color as the Heartless's skin, they may simply be its feet. Its Heartless symbol is printed on a small, yellow piece of parchment stuck to its forehead. The Nightwalker's name could be a reference to vampires, monsters that traditionally could not venture out into light. Its mannerisms also make it resemble Jiang Shi, vampire and zombie-like creatures from Chinese mythology. Though they initially were said to feed of the qi of living beings, they eventually became known as blood–suckers as well, due to influence from Western stories about vampires. Nightwalkers are summoned somewhat differently than other Heartless. The robe and hat appear along with the parchment, which is lit in blue flames, bringing the Nightwalker to life to attack its target. Nightwalkers hover in midair and ghost-fire for long-range attacks but also use their claws for close range attacks. 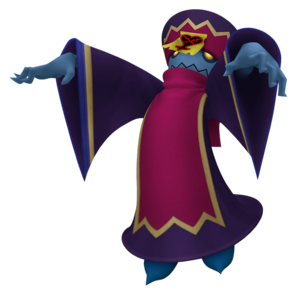 They can be difficult to defeat if Sora low-leveled, due to their aerial attacks and sweeps.